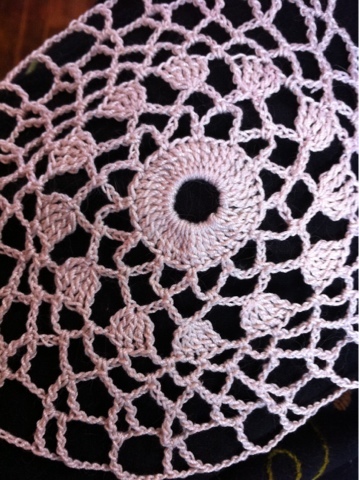 This image is of a doily that I started to make during the last couple of weeks of my grandmother's life. I would find someone to give me a ride to the nursing home she was in and I'd sit beside her bed and crochet. Sometimes it was a couple of hours, other times it was a whole afternoon or evening. She was on a fairly large amount of medication and so while she was communicative she often talked to people who were not there or addressed me by another name. Sometimes she would go through the motions of doing things with her hands and when I asked what she was doing she'd tell me she was knitting or washing the dinner dishes. The last few nights I visited she was unconscious. I continued to work on the doily. It was a complicated one with sheaves of wheat in the pattern. It was meant to line a bread basket. The pattern book had been her mother's or maybe her aunt's. She'd given it to me years before along with crochet hooks and a tatting kit that had been her mum's. I was still working on it the day she died though I didn't crochet during my visit. I just sat next to the bed holding her hand. She woke for a bit and the nurse asked if I wanted to speak to her. I did and so I went to the other side of the bed where she was looking. Her eyes were unfocused due to the medication but the nurse asked if she could see me and if she knew who I was. She said my name. I smiled and told her I loved her. Her eyes closed and she went back to sleep. Soon after I received a text that my ride was waiting downstairs. I kissed her hand and told her I'd return the next day. I can't say if I knew that visit would be the last one because she was in a place where any visit might be the last, but I was not surprised when the call came the next day telling me she'd died. The doily still sits unfinished in bag tucked at the bottom of my project basket. There will be a day that I sit down, find my place in the pattern and finish the project. I'll probably have a dinner party just so I can make and serve biscuits in a doily lined bowl. And I'll probably tell the story of how the doily came to be, and how much I loved my grandmother. There are days, like today, that I miss her so very much. That's a beautiful story. Special times to spend with her in her last days. I was close with my grandmother, and miss her a lot, too.